Recently, I traveled to Hawaii for the first time and was bombarded with macadamia nut everything—ice cream, coffee, infused sugar, encrusted goat cheese, everything. While I definitely had my share of macadamia nut ice cream, the macadamia product that most stole my heart was a locally made macadamia dip that came in a variety of flavors, including basil pesto. It was dip gold. Once back home, I wanted to infuse a little Hawaii in my cooking and be reminded of that dip. This simple basil pesto is made a bit more fancy with the swap of macadamia nuts for the typical pine nuts. 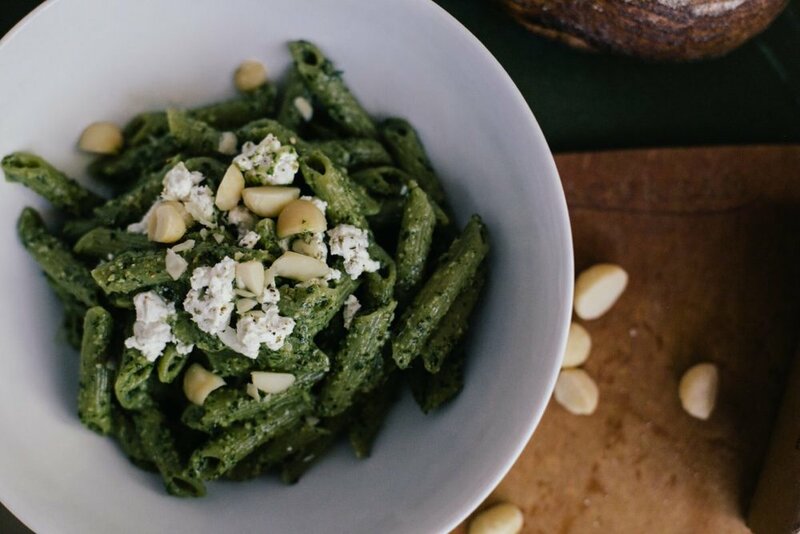 The high fat content and creaminess of the macadamia nuts works really well in pesto especially lathered all over Blue Evolution’s seaweed pasta. This recipe can also be pulled together quickly for an easy satisfying weeknight meal or it’s definitely decadent enough for a weekend treat especially when paired with a nice glass of rosé. I recommend serving this straight up with a little cheese on top, I went for a mild soft sheep’s milk one, so that the flavors of basil, nuts and cheese really shine. A simple green salad with a citrus vinaigrette and some warm slices of your favorite loaf of bread and you have a delicious dinner. Enjoy! Follow pasta package instructions and bring a pot of water to boil. Meanwhile, combine all ingredients except olive oil and salt in your food processor and pulse until basil and nuts are broken up into small, fairly uniform pieces. You’ll likely need to scrape down the sides a couple of times to incorporate everything. With your processor turned on, slowly add the olive oil. Scrape down the sides again as necessary and process until everything is combined. If your pesto is little too thick, add more oil as needed. Salt to taste. Set aside. Cook your pasta according to the package instructions. In the meantime open up that bottle of rose and pour yourself a glass. Once pasta is cooked to your likeness, drain and reserve about 1/2 cup of pasta water. Return pasta to your pot and add half the pesto and a splash of pasta water. Work quickly to incorporate the pesto adding more pasta water and pesto as needed to coat all your noodles. You want a nice coating of pesto so the flavors really pop, don’t skimp I used most of the pesto I made. Serve immediately in bowls topped with more parmesan (or cheese of choice) and a few chopped macadamia nuts. Left over pesto will keep in an airtight container in the fridge for 3-5 days. If yours is thick drizzle olive oil over the top to protect color and freshness. It’s amazing with eggs, on sandwiches, drizzled on salads, pretty much just about everything. *To make this vegan, substitute 2-3TBSP nutritional yeast for the parmesan. **This is going to be a thicker pesto than you may be used to. Since most of this pesto is going straight into warm pasta, I prefer to keep the oil content a little lighter and thin the pest with pasta water. You can add more oil if you prefer it to be more viscous.